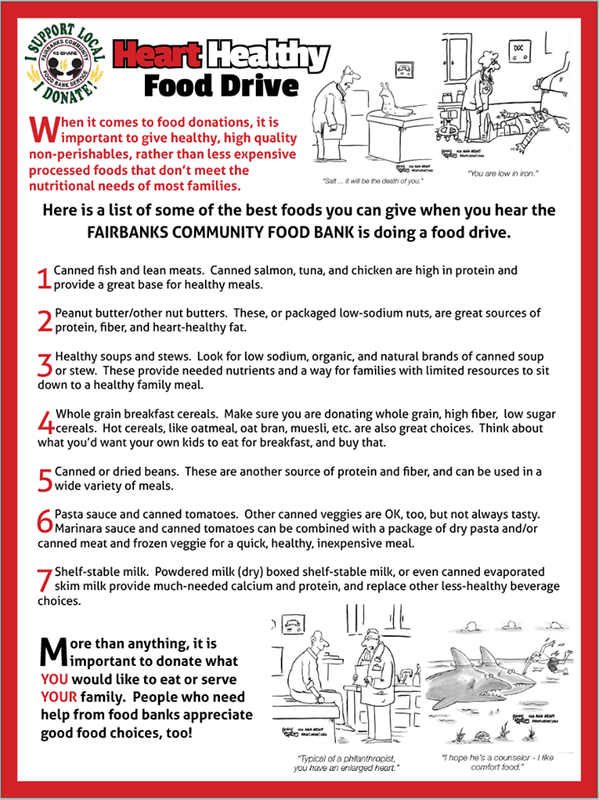 ESPN RADIO FAIRBANKS HAS TEAMED UP WITH FAIRBANKS NISSAN TO HELP OUT THE FAIRBANKS COMMUNITY FOOD BANK WITH THEIR HEART HEALTHY FOOD DRIVE. FOR THE MONTH OF APRIL WE ASK THAT YOU TAKE HEART HEALTHY FOODS TO FAIRBANKS NISSAN AT 2610 SOUTH CUSHMAN. WE ARE GOING TO FILL UP THE BACK OF A NEW NISSAN TRUCK AND THEN DELIVER ALL THE FOOD TO THE FOOD BANK ON MAY 1ST!! ESPN RADIO FAIRBANKS, FAIRBANKS NISSAN AND THE FAIRBANKS COMMUNITY FOOD BANK THANK YOU FOR YOUR SUPPORT! !